Solution Saddles Customer Stories: Junior Swedish National Team riders cannot do without their SMART™ saddles! Junior Swedish National Team riders cannot do without their SMART™ saddles! Theresa Hogart from Sweden shares her experience with the SMART saddles, used by her daughters, Junior Swedish National Team riders, Amanda and Isabella. “When you compete in mounted games, you need to have a saddle that fits both the rider and the pony. I tried many different saddle options before the SMART saddle but found I always had to return them as the saddles are often too big for the pony or too small for the rider. We are so happy to know that our ponies are now comfortable in their SMART saddles. A happy pony can do the very best at competitions and my daughters both compete for the Junior Swedish National Team in Mounted Games. We are really happy with the last SMART saddle we bought and can´t wait to get another just like it. 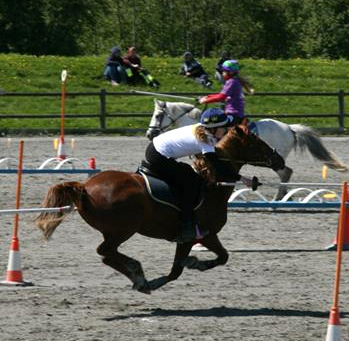 Pictures from Norway Summer Challenge show great action shots of the saddle sitting securely through fast moves and turns.